Five miles off New England’s southern coast, Martha’s Vineyard is known as a summer getaway for wealthy tourists, but the island’s year-round residents are the ones who have set a conservation example that can be instructive across New England and beyond, according to a new book by Harvard Forest Director David Foster. Since the 1970s, island residents have set aside 40 percent of the island for conservation, a feat that took planning, cooperation, and a bit of fear, sparked by a red-flag report from consultant Metcalf & Eddy in the 1970s. Now, the Vineyard is in the enviable position of thinking not only about saving what’s vanishing, but about how to add to its conservation legacy. It’s an achievement that, Foster said, parts of New England will have the opportunity to surpass in the years to come. The book, “A Meeting of Land and Sea: Nature and the Future of Martha’s Vineyard” (Yale University Press, 352 pp. ), provides an exhaustive natural history of the island, detailing its creation as essentially a pile of sand and gravel pushed south by glaciers. That beginning gave it and similar islands off southern New England a unique geography underlying an environment different from the rest of the region. In his book, Foster discusses the people who have inhabited the island, beginning with native tribes 10,000 years ago, to the first European settlers, to the current permanent residents and tourists. It’s impossible, he says, to understand the island today without understanding its people, or to conceive of successful conservation strategies without understanding the long-term relationship of the people with the land. Foster spoke with the Gazette about his book and what there is to learn from the island’s example. You’ve got 40 percent of the landscape conserved. There’s a whole group of people who say, “Well, we’ve accomplished it.” But 30 percent of the landscape is quote “up for grabs” right now. It’s extraordinarily expensive, so the question is: How do you advance conservation in a landscape where the normal players, the state agencies and so on, no longer can be effective because they can do so much more elsewhere with the equivalent amount of money? GAZETTE: Is it out of the question that more land be conserved? FOSTER: No, there’s very active land protection being done by this [Martha’s Vineyard] Land Bank, financed by a 2 percent transfer tax on every real estate transaction. The beauty of that, of course, is that the money it generates is commensurate with the actual prices of real estate, so they can do significant work. And their work is focused on both protecting land and making things accessible: making wonderful trails, making the shoreline accessible, making ponds accessible, and beautiful views accessible. GAZETTE: Is this kind of mechanism — a tax, an additional percentage on the land transfers — possible elsewhere in Massachusetts? Is it already being done? FOSTER: The legislature actually came up with this solution, or some individuals here and on Nantucket came up with this solution and presented it to the state legislature. The legislature established these kinds of land banks here and on Nantucket. There was an effort on Cape Cod to do it, and it ended up morphing into something that is related but different, which is statewide in Massachusetts. That is the CPA, the Community Preservation Act, which allows towns to add an additional tax on property. And something on the order of 140 towns in Massachusetts have done that, with the money going for conservation, affordable housing, and historic preservation. But the basic idea is actually germane anywhere. You’ve got to come up with multiple avenues to advance and fund conservation. You can have your conservation organizations and your state and federal agencies, but you’ve got to come up with changes in the tax code and alternative sources of funding. And the way to do that is, of course, to show how critical the land is to supporting people as well as nature itself. GAZETTE: In the book, you mention change being an inevitable part of the landscape. How much should people just accept sea level rise and invasive pests, if they are inevitable to some extent, and shift from fighting them tooth and nail to managing them? FOSTER: The point I’m making is a little different from that. You have to identify and pick the place to do that fighting, and you’ve got to recognize that there’s a whole series of battles that aren’t worth fighting or actually have negative consequences. The way to fight sea level rise — and I’m not talking here about downtown Boston — is not to put up big barricades all along the coast. 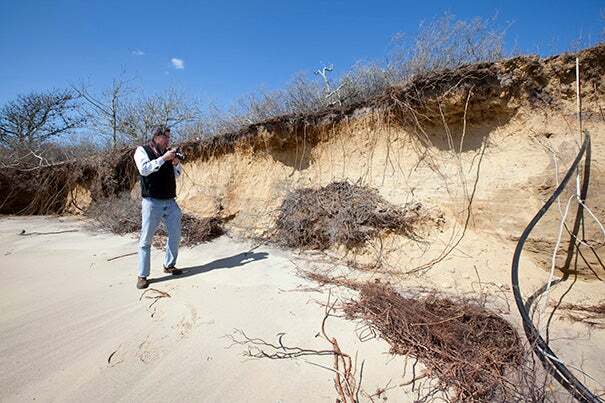 Sea level rise is going to happen at a faster rate, and it’s going to erode Martha’s Vineyard. You fight climate change, not the manifestations of climate change. The same thing is true of invasive pests and pathogens. There’s tremendous money going to try to control these things in the landscape, or, even less wisely, to go into the woods and try to fix the problem in the woods. You hear, “These are unhealthy forests, so we’re going to go and cut down the trees.” Yes, it gets rid of the trees that are dying and the forest looks more healthy, but it actually doesn’t do anything to address the problem. And, in fact, the forest is much more capable of recovering if you just leave it alone. So, the battle is not to be fought in the woods. The battle is to be fought at the point of entry of pests and pathogens. The Harvard Forest-based Science and Policy Exchange released a study of all of this. It showed how — to put it in Trumpian terms — we really should be building a wall. But that wall should be at the point of entry for insects and pathogens. And that wall should be built by the countries and the industries that are actually introducing those pests and pathogens, on wooden pallets or on imported plants or imported soils or imported fruits. That’s the only place you can actually hope to stop pests and pathogens. Doing it in the woods is almost impossible. And nature has this phenomenal ability to cope with the actual impacts. We shouldn’t be fighting the manifestations of these problems in nature, and we shouldn’t be bringing this attitude that we’re in a position to help nature, to improve nature. GAZETTE: So even a well-conserved natural world, 50 years from now, will look different. The population of trees will shift, the insects we see in the forest will be different, probably more so close to roadsides and urban areas. You’re embracing a landscape that is inevitably changing? FOSTER: Absolutely. If you go back to the day of Henry Thoreau, when between 60 and 70 percent of Massachusetts was in farmland, the transformation that has occurred from that time to the present — the numbers are flipped, we have about 62 percent forest now, about 10 percent farmland — that transformation is both phenomenal and much greater than anything that climate change or pests and pathogens are going to do. And we’re still in the midst of that change, because all of these forests are young. Even if we do absolutely nothing and the climate doesn’t change and pests and pathogens don’t come in and we just stand back, our landscape’s going to be transformed just by the ongoing changes that are occurring in every forest and every untended field and shrubland. You absolutely have to embrace change. GAZETTE: Near the end of the book, you talk about the “Wildlands and Woodlands” vision that Harvard Forest has developed, embracing multiuse, close-to-nature activities like farmlands and woodlots from which wood products are extracted, as well as lands conserved as purely wild. 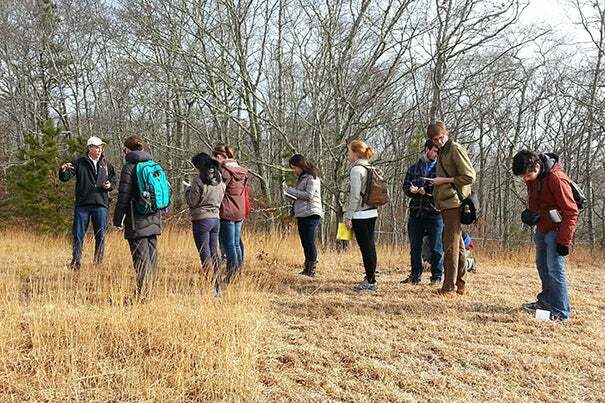 How important is the acceptance of a diversity of landscape uses in successful conservation in New England and perhaps around the world? FOSTER: That kind of integrated approach, in which you combine a wide range of uses of conservation land along with setting aside true nature preserves, can be modified to work in every landscape. And I think that is really the direction that conservation everywhere is headed. It helps to recognize the value that nature provides to people, including native people. It keeps them on the land, deriving resources. It also recognizes the value that nature gives to all of society. If people are able to be in nature, use nature, derive resources from it, there is this thought that they’ll value it more, they’ll recognize where resources actually come from — which we do less and less — and so keep it intact. GAZETTE: Is that also related to the concept of “illusion of preservation” that you talk about in the book, which I hadn’t heard before? FOSTER: That’s actually a wonderful story, because that’s an undergraduate thesis from Harvard University, produced by a former student, Mary Berlik Rice, who is now a great medical and environmental researcher at Harvard Medical School and the Center for Health and the Global Environment [at the Harvard T.H. Chan School of Public Health]. It’s a notion I had thrown out in my forest ecology class in the ’90s, and she picked up on it and said, “Let’s actually see how that would play out.” So she wrote a senior thesis about it, and we published it together, and it’s been used ever since. So her argument and our argument and the argument in the book is that no, it’s actually better to derive many resources — like wood and food — locally so that our kids will grow up thinking of these coming from local forests and farms, and they’ll value these for something beyond their beauty and nature and so on. GAZETTE: As we talk about the regrowth of New England’s forests, are we in a moment of opportunity for conservation here? FOSTER: History has given us a second chance to treat the forests of New England well. The first time we cut them all down and turned them into farms. When we abandoned those farms, they came back. Now we’ve got these magnificent forests, which are not just beautiful but are cleaning our water and cleaning our air and are storing carbon, which is mitigating climate change. So, they are doing all this wonderful work for us. We should treat them better in the future and retain them and derive many values from them. I think there’s also a general opportunity. I’ve been out here on the Vineyard giving talks about the book. I try to make the point that we’re in a time when individuals can do things locally — in terms of conservation, retention of forests, of policy that influences taxes that affect conservation — that translate into real global benefits. You focus on a place like Martha’s Vineyard not just for the benefit of Martha’s Vineyard but for the fact that the message pertains elsewhere. This is a story that is much bigger than one island. Sophomore Sela Kasepa, a native of Zambia, launched and mentored her country's FIRST Global robotics team. "As a nation, Zambia needs to drive toward innovation, and these students can be leaders in that arena,” she said.